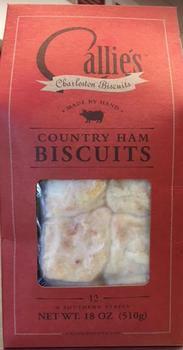 Callie's Charleston Biscuits is recalling Country Ham Biscuits and Cocktail Ham Biscuits. The products may contain Johnston County Hams, which were recalled in early October due to possible contamination with Listeria monocytogenes. No illnesses have been reported to date in connection with the recalled products. Customers who purchased the recalled products should not consume them, but discard them or return thems to the place of purchase. Consumers with questions regarding the recall may contact Kevin Hackler at (843) 577-1198.